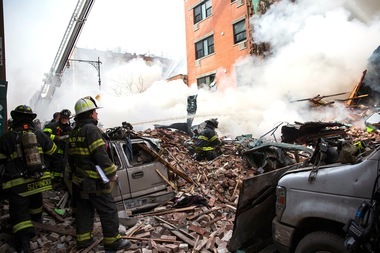 Firefighters respond to a 5-alarm fire and building collapse at 1646 Park Ave. in Harlem on March 12, 2014. EAST HARLEM — Con Edison's faulty pipe joint was the source of the gas leak that ignited the building explosion that killed eight people and injured dozens, state regulators said Thursday. The utility used uncertified workers to install the pipe, failed to inspect the fusion joint prior to the explosion and did not call firefighters as soon as they got reports of the gas leak, the New York State Department of Public Service found, according to a 97-page report on the building explosion on Park Avenue between 116th and 117th streets on March 2014. The investigation also concluded that the city failed to repair a sewer collapse, which contributed to the cause of the joint failure. The state’s findings, specifically the safety violations, could result in financial penalties against Con Edison. The utility company has 30 days to respond to the report, according to the Public Service Commission. Con Edison defended their position that the fatal blast was caused by city’s failure to repair the sewer pipe. “We maintain that a cracked fitting, damaged by undermined street infrastructure from a pre-existing sewer breach, was the source of the leak that led to the East Harlem gas explosion,” the utility company said in a statement. The state's report may take some of the legal pressure off the city, which could face $1 billion in lawsuits from victims, based on notices of claim filed last year.